Mixing with a food processor. The absolute easiest way is to use a food processor. Put flour, salt and sugar into the food processor. Cut the butter into cubes. Approximately 2*2 cm (1" * 1"). Put the butter into the food processor. Blend the mix until it gets the consistency of sawdust, with a lot of small grains. Mix the egg in a little at a time, until dough begins to gather into larger clumps.Approximately half the eggs. Take the dough out of the food processor and shape it into a round ball. The manual method is easier to describe but more difficult in practice. Mix flour, salt and sugar on your table. Put the butter on top of the mix. Chop into small pieces. I use a wide spatula which I bought at a DIY store. Mix the butter and the flour together and chop it into smaller and smaller pieces until it has the consistency of sawdust. Whip the egg and pour approx. half of it onto the flour mix. Roll the dough flat on a flour covered board. Most sources tell you that you must put the dough into the refrigerator before you roll it. But I've never found that necessary. But if it does falls apart too much, put it in the fridge for half an hour and try again. Grease up the bottom of the tart mold or cover it with baking paper. Roll the flattened dough onto a rolling pin and roll it out in a pie form. Press the dough into the edge of the mold and cut the excess dough off. Poke the dough with a fork so the bottom doesn't bulge while baking. The holes will let the steam out. 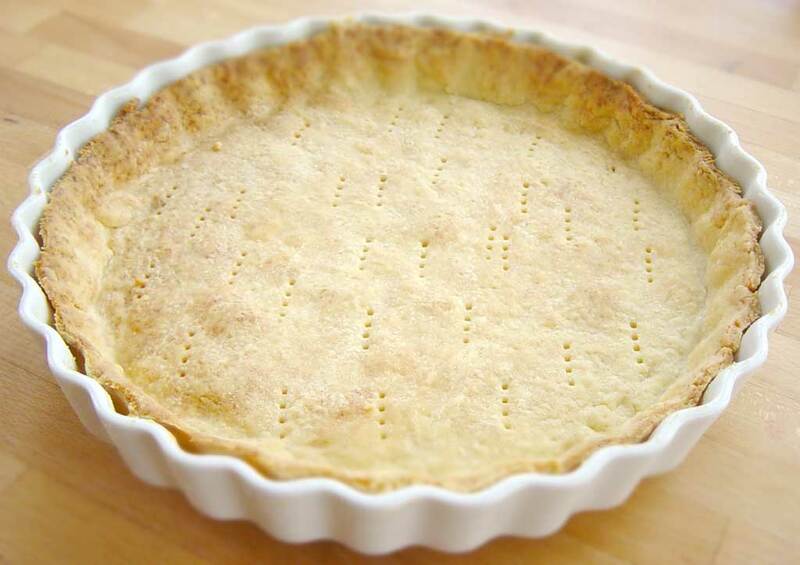 Bake the tart bottom at 200°C (390°F) for 20-25 minutes. You can easily use a stand mixer or hand mixer to knead the butter into the flour. Just pour it into a bowl and whip it until it has the right consistency. On my Kitchenaid and Kenwood I use the meat hooks. Not the mixer. With a hand mixer I just use the normal beaters. You can also move the rolled out dough with a pizza shovel.